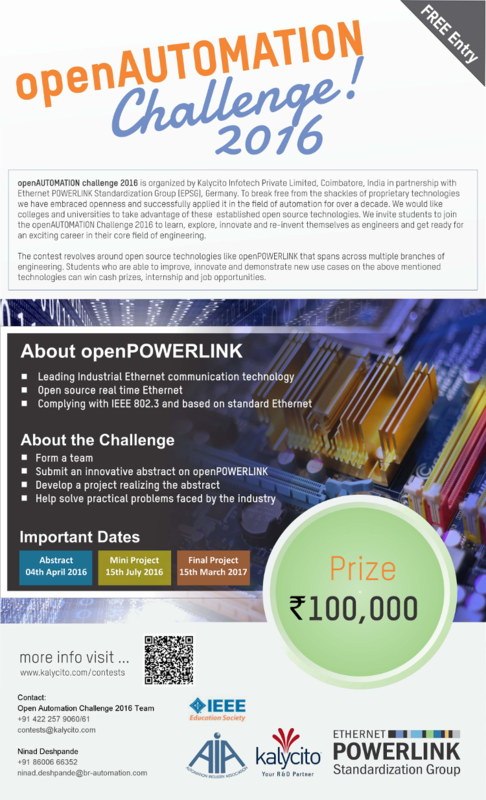 openAUTOMATION challenge 2016 is organized by Kalycito Infotech Private Limited, Coimbatore, India in partnership with Ethernet POWERLINK Standardization Group (EPSG), Germany. To break free from the shackles of proprietary technologies we have embraced openness and successfully applied it in the field of automation for over a decade. We would like colleges and universities to take advantage of these established open source technologies. We invite students to join the openAUTOMATION Challenge 2016 to learn, explore, innovate and re-invent themselves as engineers and get ready for an exciting career in their core field of engineering. The contest revolves around open source technologies like openPOWERLINK that spans across multiple branches of engineering. Students who are able to improve, innovate and demonstrate new use cases on the above mentioned technologies can win cash prizes, internship and job opportunities.